MEGA BEARDO: Belmont 2 Is Finally Here! Belmont 2 Is Finally Here! 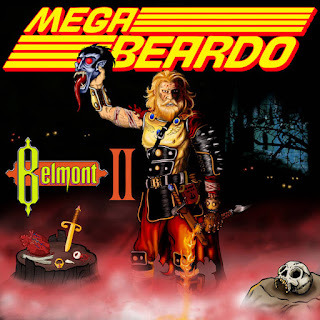 I am stoked to finally say that Belmont 2 is available for download now! It has been nearly three years since I publicly announced I was working on this album, and I obviously didn't mean for it to take this long. I had originally wanted it out in October of 2016. Hoo boy, did I miss that deadline. Frankly, I'm glad it took three years because it gave me an opportunity to really refine the songs and tell the story as I intended to tell it. The first Belmont was easy to write. I knew exactly how many songs it would take and what each song should sound like. Belmont 2 had to be done differently, and it took a while to crack that code. Some songs were re-written multiple times, while others were combined to make one. And the longer I kept working on the songs, the darker they got. I can't quite put my finger on what happened in November 2016, but my outlook got quite bleak at that point. The lyric "When darkness exists, we must resist" came out while re-writing "Shadows of the Hell House," and it set the course for the tone of the album. I have to give special thanks to the five people who helped me make this album whole. I've been wanting to work with Angel "Masikus" Hernandez again ever since we did Ledjent of Zelda together in 2013. He's just so good on drums, so I knew I had to get him on Belmont 2. I also brought in my good friends Amanda Lepre, who has been partying hard on the road with Andrew WK, and Erik "Viking Guitar" Peabody for some guest vocals for The Maiden and Dracula respectively. Brian Pickens, my frequent collaborator, absolutely killed the artwork, and my good friend Terry Smith, once again, mixed and mastered the album. I told them I wanted it to look like the Castlevania 2 cover of Nintendo Power and sound like a Mastodon record, and they 100% delivered. Thank you for all your support and patience for this record. It is good to know there is an audience for my silly Castlevania concept records.